Traditional microscopy is now a thing of the past. Artificial Intelligence (AI) and all its implications of machine learning are poised to revolutionize the way in which Pathology will be viewed and defined. With the conventional modes of diagnosis being replaced by technologically advanced digital tools and software opens up a plethora of opportunities toward medical advancement. With larger volumes of data, newer technological methods and endless resources that are available to pathologists at lower costs, AI in pathology is set to achieve many laurels that were previously considered impossible. Lab testing with artificial intelligence translates into intelligent algorithms that are capable of identifying general and specific patterns that can then offer logical and reliable predictions toward patient diseases. Pathology in the ‘digital’ world further allows long distance association. This means that sending digital material from one end of the world to another comes bereft of constraints such as tampering. Through this association, the possibilities of collaboration are extended and lab growth is enhanced through increased access to specialists around the world. However, artificial intelligence in digital pathology cannot be looked at as a replacement of pathologists. Intelligent technologies, artificial intelligence for medical tests and AI-based diagnostics in healthcare are only a tool to increase the efficiency of human pathologists and cannot be looked at as an individual entity. Outsourcing of lab testing – The increased susceptibility of tampering due to the outsourcing culture established among pathology. Marginalization of pathologists in healthcare – Pathologists are increasingly disconnected from routine healthcare practices and patients, causing isolated diagnosis. Reducing number of pathologists – The number of professionals going into the field of pathology is steadily declining. Complications in laboratory testing – The requirement of expertise and testing protocols create various complications in the lab testing procedures. Minimal clinical interaction – Pathologists are not involved in clinical processes and patient examination, which interferes with holistic diagnosis. Financial constraints – The financial constraints that come with lab testing hampers the quality of pathology. Resistance to new technologies – Most pathologists are more comfortable with conventional procedures and demonstrate a resistance to evolving technologies and machine learning. According to the National Cancer Institute, “A pathology report is a document that contains the diagnosis determined by examining cells and tissues under a microscope. The report may also contain information about the size, shape, and appearance of a specimen as it looks to the naked eye. This information is known as the gross description. 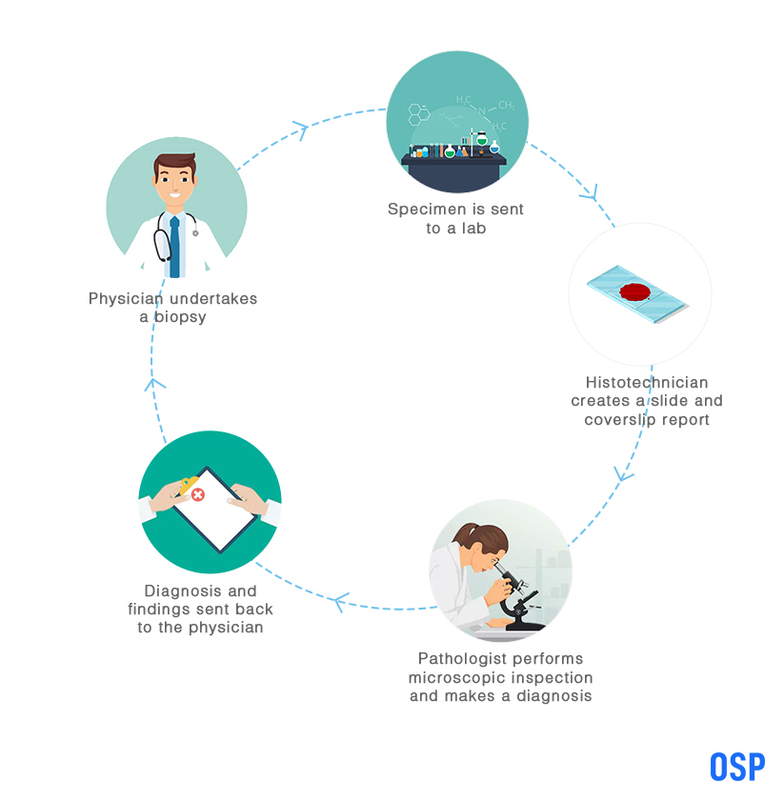 The conventional method of pathology begins when a physician or a clinician performs a biopsy on a patient and sends these samples to a pathological lab for testing. Let’s pursue this through an example. John Smith approaches a clinic with the complaint of a tumour in his left leg. The physician then prescribes for a surgery to take place that will remove a part of or the entire tumour, which is then sent for lab testing. Thus, begins the pathology process. Upon receiving the specimen, the laboratory deploys the services of a licensed histotechnician to analyse the biopsy. This is undertaken through processing the tissue, embedding the specimen into a cassette, then the tissue is cut, fixated into a slide, the slide is stained and a coverslip is placed with the slide. This slide is then handed over to a pathologist, along with the cover slip and a report that details the John Smith’s demographics, the type of biopsy performed on the tumour, the area of the tumour, the physician’s description and the initial report. With this information, along with a microscopic analysis of the slide, the pathologist then provides a diagnosis and a description of the findings through microscopic inspection. This diagnostic report is then sent back to John Smith’s physician for further action. Artificial intelligence based diagnostics is capable of transforming this process towards increased efficiency through its lab testing device. The lack of pathologists in the general field, with most pathologists choosing a niche area of operation. A lack of focus on the molecular basis of the disease, with an approach that is too narrow and does not address the situation holistically. The minimal interaction between the physician/ clinician and the pathologist makes meaningful collaboration and comprehension difficult. AI in pathology is the answer to every woe faced within healthcare pathology. The efficiency of lab testing with artificial intelligence is undeniably higher through the use of intelligent machines that are embedded with software for digital imaging. When it comes to diagnostics, artificial intelligence based diagnostics through AI-based diagnostic devices offer a shorter turnaround time then traditional microscopic testing. Further, the possibility of errors is reduced through quality control of digital pathology software. One of the biggest advantages of AI in digital pathology is the ability of pathologists to send data and images to different specialists around the globe that enhances research, diagnosis and collaborative diagnosis, without the need to physically move the specimen from one location to another. The automated features of AI in pathology, including AI for medical tests, reduce manual errors that are often witnessed in physical inspections. Finally, with the reduction in pathology specialists being educated around the globe, artificial intelligence in medical testing and diagnosis allows for a favourable amount of research and quality education through the record of a large amount of case studies. 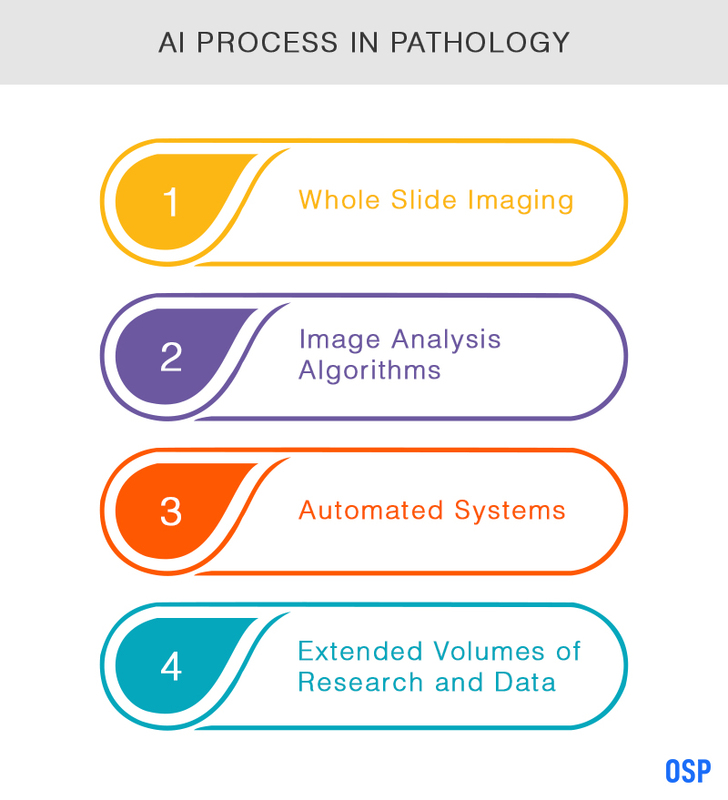 The automated nature of digital pathology that is empowered with artificial intelligence, will moreover, allow a pathologist to increase their productivity by a considerable margin by reducing the manual process and mundane sections of pathology report generation. Machine learning will make diagnosis more accurate and prompt. Digital Whole Slide Imaging (WSI) expands its reach by capturing the entire sample/ specimen on the slide, as opposed to the limited view of microscopic study. Pathologists in the digital realm are no longer dealing with glass, but with pixels that can be sent to any part of the world for specialized examination. Through image analysis algorithms, AI in medical testing allows for automated analysis that is generated through the basis of research and recorded data in the software.